GT-Command operates together with Uhlenbrock Intellibox® Märklin Central Station®, Fleischmann Twin Center® , ESU ECoS®, Roco 10785, and Lenz LZV100. GT-Command is command control allowing you to use your voice or write on your PC. 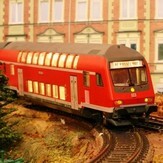 GT-Command helps you to command your trains, your points, and all other digitalized accessories. Normally you would use the buttons on your controller, the pen on your flat screen or maybe a remote controller. With GT-Command you command directly using your headset. GT-Command allows you to do this directly via your headset or your PC. The command control has a unique and simple language making it easy to write or speak. Using GT-Command you do not need to worry about which point or which train is currently associated with a button or if the right one is on the display. You have free access to all units and trains in the order you prefer. The integrated filtering and validation ensure that you can only command what you have named and numbered. Voice control works in a free flow with the mike open all the time, or in a more controlled way in which you only open the mike when you want to speak a command. It is easy but requires that you speak clearly and at a normal pace. If you buy GT-Command from your dealer, a headset tested by us is enclosed. However, most headsets of good quality can be used. GT-Command has been tested over a long period of time and much experience has been gained. The product includes thousands of names which you can apply to your trains, sound effects, lights, etc. However, in order to ensure an efficient execution of commands and good voice recognition, we recommend you a method to number your other units. An example is the integrated Stop-all button on the keyboard, which corresponds to a Stop all command, where all speeds are set to 0. GT-Command is delivered from dealers in a package including GT-monitor and GT-Automation, headset, and CD - ready to use. GT-Automation operates together with Uhlenbrock Intellibox® Märklin Central Station®, Fleischmann Twin Center®, ESU ECoS®, and Roco 10785, Lenz LZV100. GT-Automation is yet another utilisation of the unique command language in GT-Command. GT-Automation allows you to script a sequence of many commands. In the sequence you can include conditions, pauses, repetitions, etc. We call it a command sequence. You can build as many as you like and execute a single one or several in combination. You can use GT-Automation to drive your trains back to starting positions, or you can use it for shuttles crossing each other where you need to wait for another track occupation, or you can apply it for your base traffic, and then control other trains with voice control. GT-Automation allows you to play complicated games faster and above all you have your lights, sounds activated and the fun part that you often forget to activate when driving. It is going to be more fun faster. GT-automation operates in combination with GT-Monitor and GT-Command. Therefore, you can also use voice control for trains under automation. 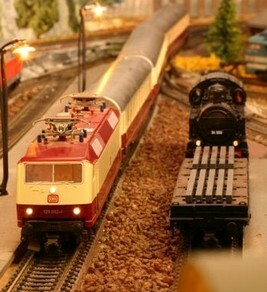 You do not only control trains but also routes, points, de-couplers, turntables, etc. through automation. GT-Automation has multiple numbers of timers. You can use any S88 or track occupation with a digital address to make conditions. GT-Automation can operate up to eight concurrent automations. GT-Automation is delivered in a package including GT-monitor and GT-Command, headset, and CD - ready to use.